Cool Toe Nail Art Designs. There are numerous ways to polish your look to perfection and one of the best ways to do that is by paying more attention to your nails. Get your toenails looking salon-fresh with the following pedicure nail art designs and experience the power of pretty polished nails! Pretty polished nails have become a definite must have when it comes to beauty and style and the possibilities seem limitless as far as design goes. A stylish pair of sandals or flip-flops needs to be paired with cool pedicure nail art designs as this combo is not to be overlooked as the results are absolutely amazing. Small details are the ones that make the difference when it comes to beauty and style, so make sure you pay as much attention as possible to your mani and pedi. Simple nails are always a good idea especially if you're not too skilled at doing your own nails, but if you're looking for nail art designs that deliver a high visual impact, you need to allow a bit of extra time for pampering your toes. The best thing about pedicure is that, unlike your manicure, its results last for much longer, so you'll only have to struggle with a sophisticated pedicure nail art design once every two or three weeks. If you're looking for cool pedicure, take a peek at the following nail art designs that match perfectly the trends and draw inspiration for your next pedi session. For those addicted to elements that pack a heavy dose of bling, all glitter or shimmery packed nail polishes are a definitely must and the results these nail lacquers can deliver are astonishing. 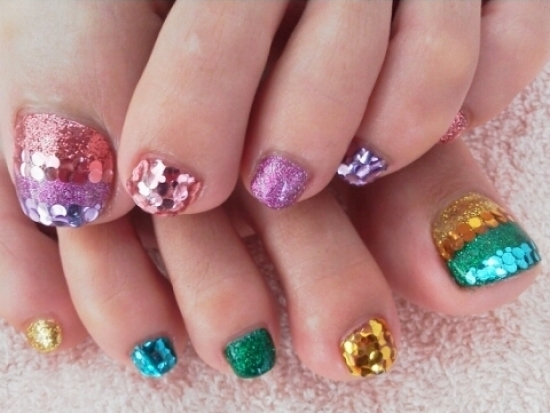 Get your toenails looking all glam by applying a glitter nail polish or glitter dust/flakes over a wet nail polish and go symmetric or asymmetric by coating a few toenails using a monochrome, creamy finish nail polish in your favorite tone. Opt for an all glitter, monochromatic nail art or mash-up your favorite glitter hues as the higher the contrast the more obvious the result will be, so adapt your look to your mood. To get the perfect design seal the nail art style with a clear top coat as this way your nails will receive a high shine that looks oh-so-professional. Every season certain details manage to conquer the public's attention and this year pretty polka dots, flirty bows and neon nail polish hues are the details that should definitely make their way into your style whether it's fashion or nail art you're talking about. Pretty polka dots look fabulous and due to the low skill level required in the creation process, they can be created with ease by everyone using a dotting tool or a toothpick dipped in nail polish. Neon nail polish looks hot and matches perfectly the sizzling summer season, so choose to mash-up your favorite neon nail lacquer pigments instead of going simple as this way your toenails will capture even more attention and will look so much more youthful. However, if you're into bows, you're going to need a bit of practice and skill as drawing perfect looking bows isn't all that easy as it sounds. The best results are obtained using a thin nail art brush but if you wish to get impeccable results without putting in the effort, opt for nail art stickers which you'll apply over dry nail polish and seal with a clear top coat to ensure its duration. For the honeys that adopt an ultra feminine style, floral motifs are a perfect choice for their digits and toenails and there are numerous methods to get your nails all flowered-up. Use a toothpick to apply circular dots of the same color and apply a yellow-orange dot in the middle to create a simple yet stylish hand painted floral motif, use nail art brushes dipped in acrylic paint to achieve oversized floral patterns or use a nail art needle to mix two contrasting nail polishes and achieve a cool rose-like nail art. If you're into easy nail art, opt for nail art stickers, dry flowers or Konad stamps (which are easy to use and fabulous) and get your toes looking super stylish. Go bold or go simple as the possibilities are endless and the results are undeniably hot!